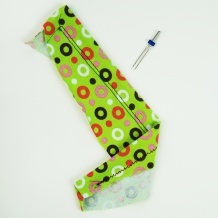 A lot of people are nervous, scared or downright terrified when they need to insert a zipper in their sewn item. But guess what? 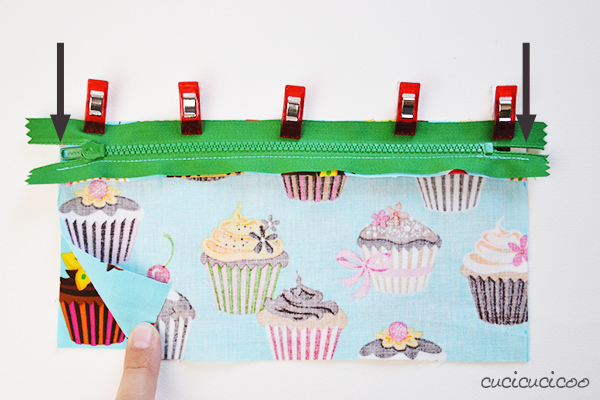 It doesn’t have to be difficult and knowing how to sew a zipper is a very useful skill, and opens your work up to all sorts of new possibilities! 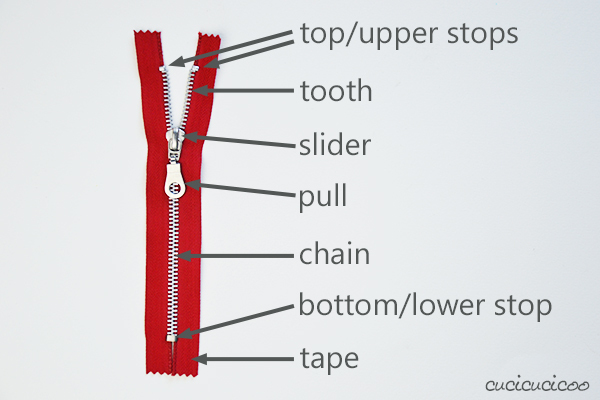 There are actually quite a few different ways to sew zippers, not to mention different types of zippers themselves, so I will bit by add to this zipper sub-series that is part of the Learn to Machine Sew series. 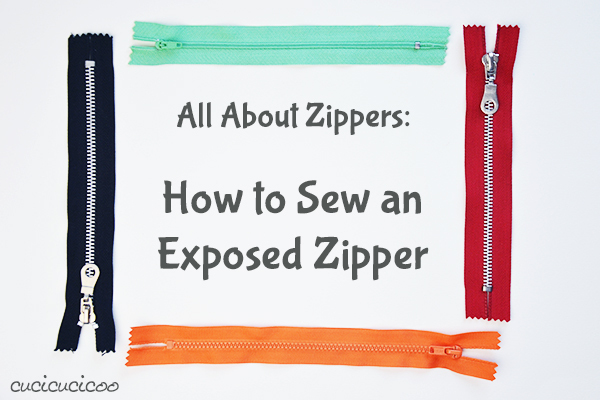 Today we’ll talk about the most basic application of an exposed zipper. But first, let’s talk about zippers themselves. They come in all sorts of lengths and colors, and their teeth can be one of three different materials: nylon, metal or plastic. The very first zipper closures invented had metal teeth. These aren’t my favorite to use because it’s complicated to shorten them and the teeth sometimes need some type of lubrication. If you find that your metal zipper is not working smoothly, rub a bit of dry bar soap or a candle on the teeth and it should work better. Zippers with plastic teeth are pretty common. The large teeth give them a sort of sporty look and I find them nicer-looking than those with metal teeth. They are very strong. You need to be careful when ironing fabric sewn to this type of zipper because the hot iron can melt the teeth, thereby ruining it. 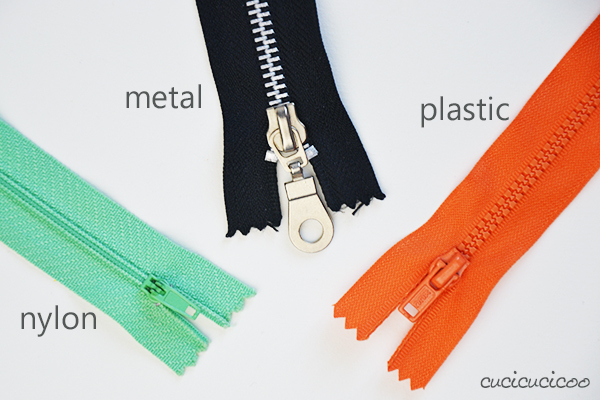 Zippers with nylon teeth are generally the most widespread type. They are light, inexpensive and more delicate-looking than those with metal or plastic teeth. 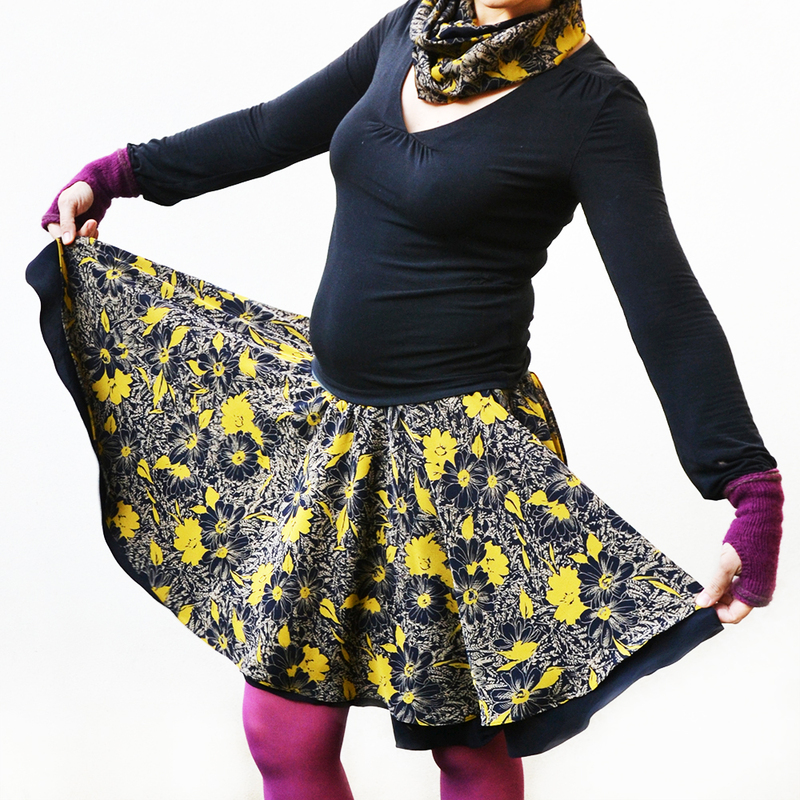 Another great thing is that you can sew right over the teeth if you need to shorten the zipper. The coiled teeth, however, can get pulled off of the tape backing more easily, though, in which case the zipper needs to be completely replaced. Now let’s look at the anatomy of a zipper. 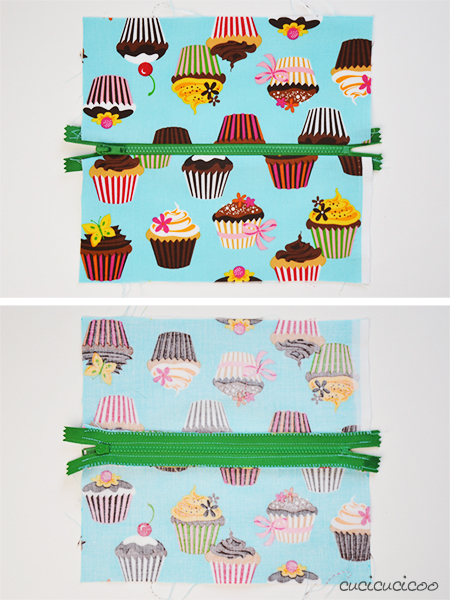 Every zipper has a fabric backing, the tape, and that is what gets sewn. The slider gets pulled up and down the chain. Inside the slider, the teeth get inserted one between another to close it. The upper and lower stops block the slider from accidentally running off the zipper chain. You probably already know all these parts, even if you didn’t know the technical names for them. Do note that there are different types of zippers. They can be one-way or two-way (with one or two sliders, respectively), open-ended or closed-ended (the tape on open-ended ones can be separated on both ends, such as we see on jackets, and closed-ended ones have a lower stop on both ends, keeping the tape ends together) or invisible zippers (in which the teeth are hidden, often used for garments, and for which you need a special invisible zipper foot to insert). In this lesson I will only discuss the classic one-way zipper such as the one pictured above. Ever wondered how a zipper actually works? Basically, the inside of the slider fits the teeth one between the other perfectly when closing a zipper, or separates them when opening it. Nobody ever really thinks much about the zipper because it’s such a seemingly simple everyday object, but it’s history is actually pretty interesting. I really enjoyed reading this Wikipedia page on zippers (which is where I found this cool animation). Like I said before, zippers come in a wide variety of lengths. 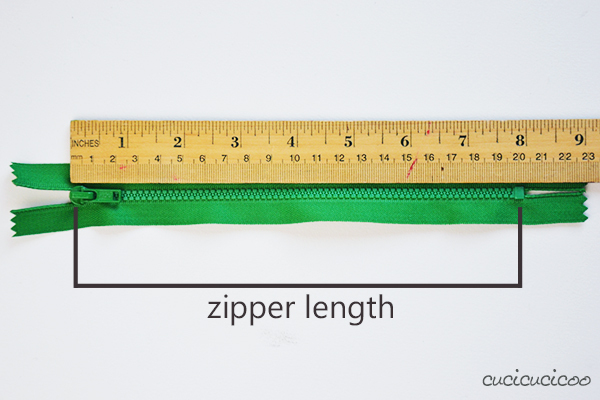 The distance between the stops is the zipper length, so the example above is a 20-cm- (8″-) long zipper. 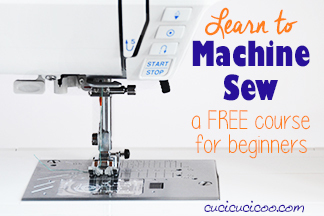 Most likely, your sewing machine came with a zipper foot. 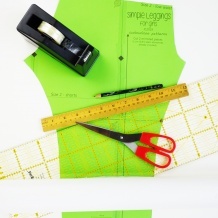 This is the key to inserting a zipper so that it looks good. 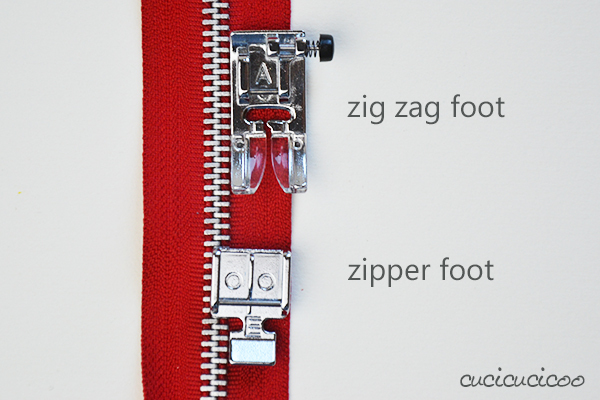 There are different styles of zipper feet (not counting the invisible zipper foot), and the type you’ll use will depend on your sewing machine. Yours may look different from mine, so be sure to read your machine’s owner’s manual to learn more about your zipper foot. Look at the pictures above, which compare a standard zig zag foot with a zipper foot. 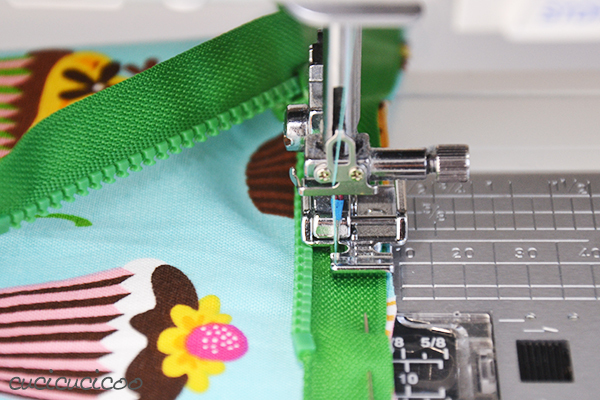 Most sewing machine feet have one opening for the needle to pass through, but the zipper foot has two so that you can sew on either side of it. 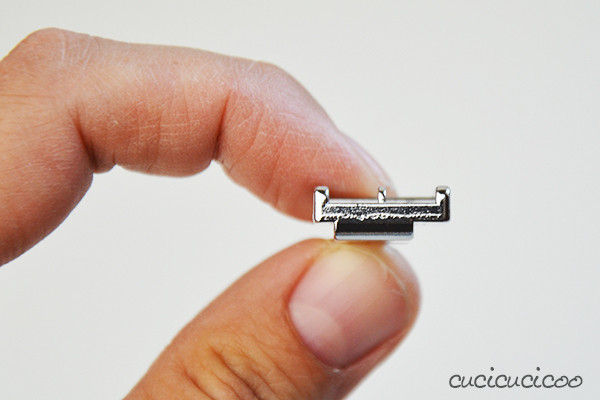 Also, the clip on point is closer to the edge of the foot, meaning you can get closer to the zipper chain when sewing. Let me show you what I mean. The edge of the standard zig zag foot bumps against the zipper chain, so can only get so close to it. The zipper foot, however, with both its reduced width and its irregular bottom, can get right up close to the zipper teeth. 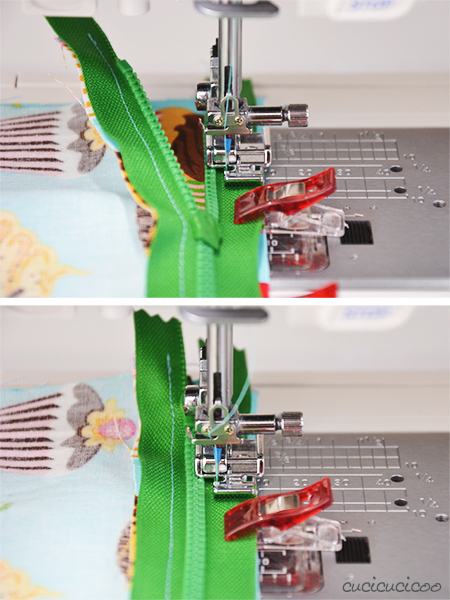 The type of zipper foot that I have has two bars to snap on to the machine, so that you can sew along either the left or the right side of the zipper. In theory the left side of the foot is for sewing the zipper, and the right foot for topstitching along the zipper. (You may have to move the machine needle to left or right to use your zipper foot. It depends on the foot and machine. I can leave my needle in the center position when using the left side, but for the right side I need to move the needle to the right so that it doesn’t bang into the center of the foot.) I quite honestly always use the left side of the zipper foot, as you can see above, because that’s just how I’m used to using it, but I suggest that you try both sides. 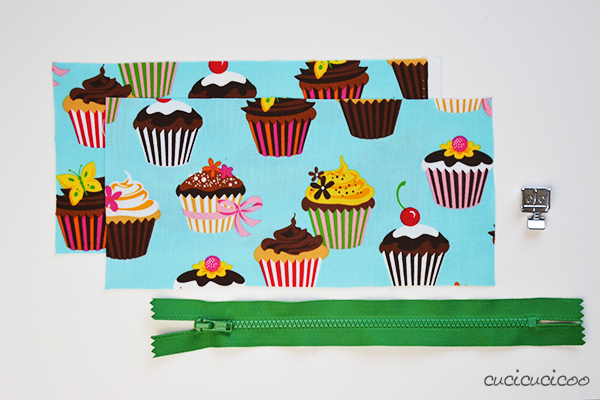 If you want to make a different size pouch (or pillow cover or whatever else), make sure that the top of your fabric pieces are 1″ (2.5 cm) wider than the zipper length. 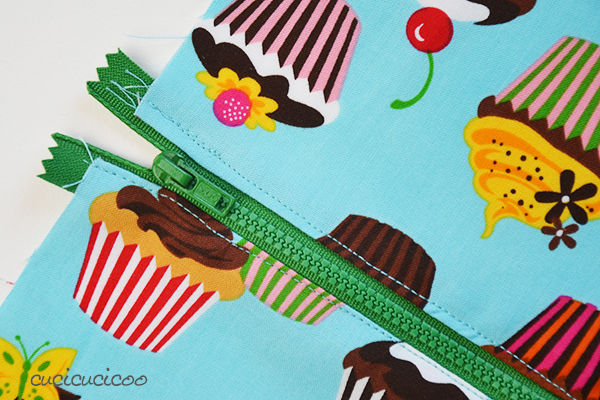 That accounts for 3/8″ (1 cm) seam allowance on both sides, plus a little extra breathing space beyond each zipper stop. 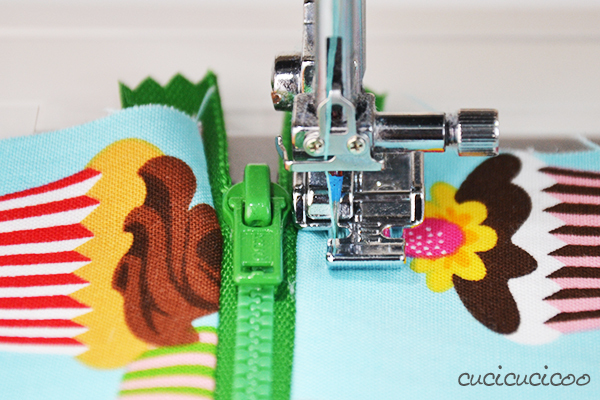 Put the zipper foot on your machine and position the end of the zipper with the lower stop underneath the foot. 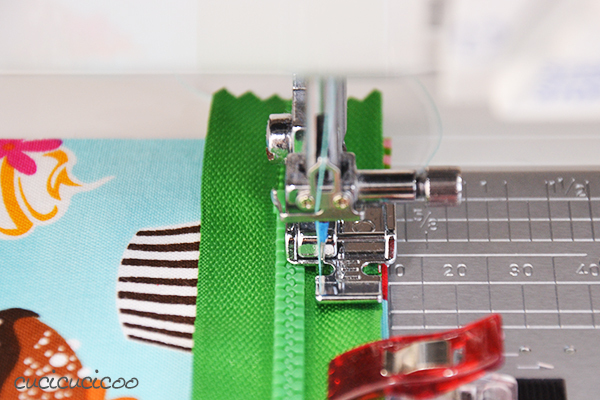 You can start right at the end of the zipper tape, but I prefer to start at the lower stop so that I can position the zipper the right distance away from the needle. 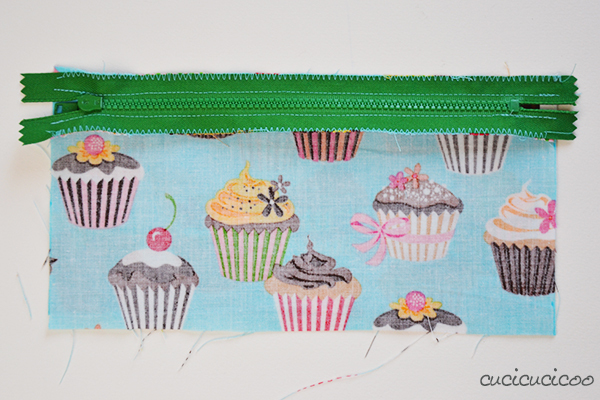 Backstitch all the way to the end of the tape and/or fabric edge. Then sew forward again. 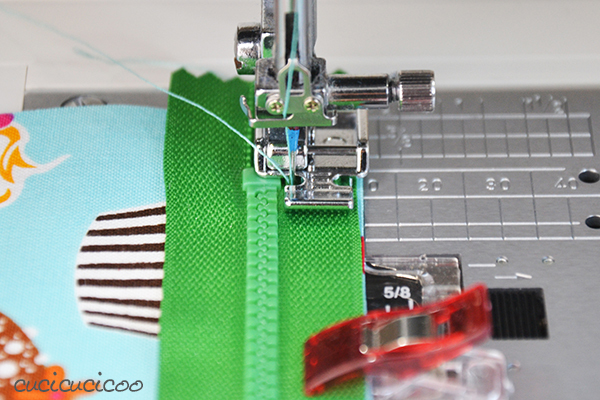 Remember to use the guides on the needle plate or line the zipper tape/fabric edge with the right edge of the zipper foot for an even seam allowance. Continue until you get a little bit away from slider. 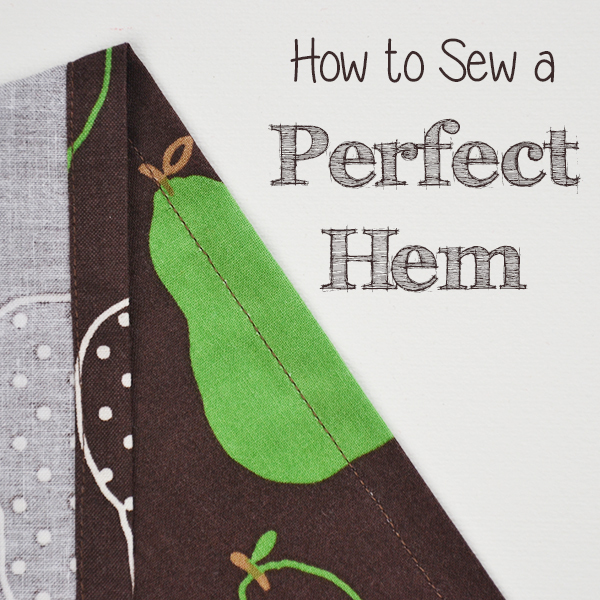 Unless you are sewing with a very small seam allowance (a.k.a. far from the zipper chain), the zipper foot will have problems getting past the slider. You have two options now. 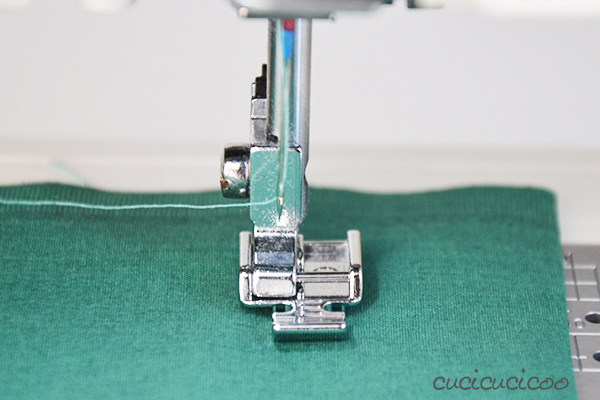 You could backstitch, remove the zipper/fabric from the machine, unzip the zipper, put it back under the needle, backstitch and continue sewing to the end, which is what Dana shows in this awesome video on sewing zippers. But what I generally do is this: lower the needle into the fabric, lift up the presser foot and swivel around the fabric until you can unzip the zipper. Then straighten the fabric again, lower the presser foot and continue to sew to the end. Don’t forget to backstitch at the end! Ta-da! You have sewn one side of your zipper on! Look how nice it looks when you flip the zipper right side up! Sewing the second side is pretty much the same, except for a couple things. 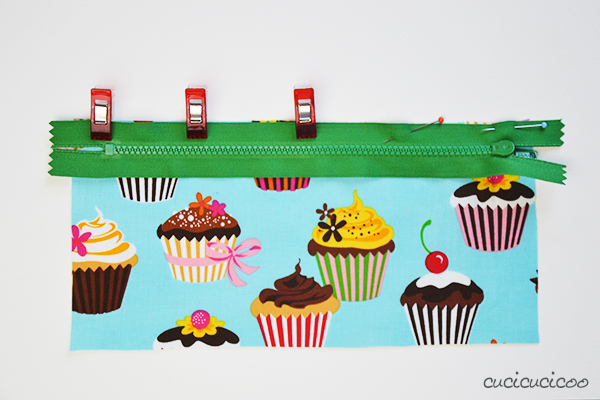 When you clip/pin the zipper to the fabric, the slider will be at the left and the wrong side of the first piece of fabric will be on top. Make sure that the side edges of both fabric pieces line up. 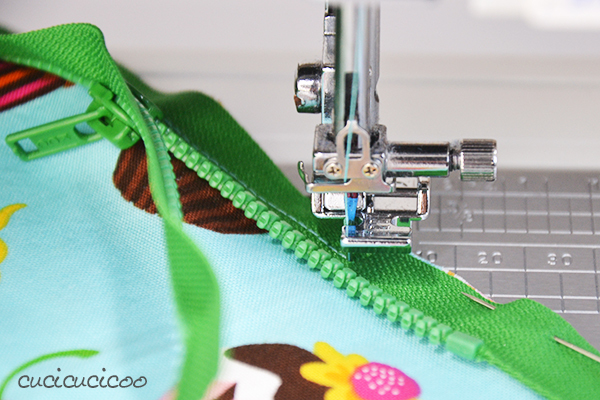 If you want, you can start sewing from the bottom stop again, but you will have to move the zipper foot over so that you can line up the right edge of it with the left edge of the zipper chain. I prefer using the left edge of the zipper foot, however, which means that I need to start sewing from the upper stop. 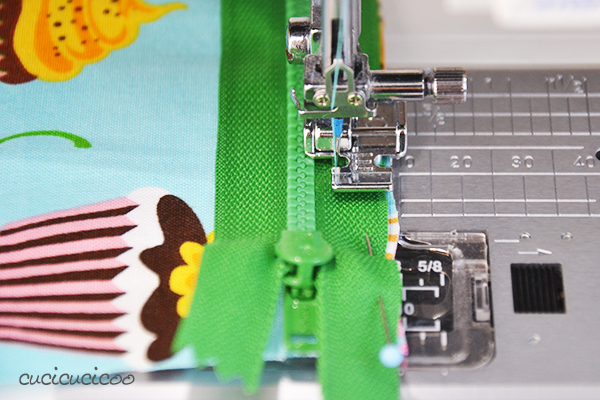 To avoid the slider, you need to unzip it a little bit and start sewing. Then use one of the methods described before (remove the fabric from the machine, zip up, and put back in the machine, or lift up the presser foot, zip up, and lower the presser foot) to close up the zipper so that the slider is behind the needle. If your fabric frays (as you can see mine was starting to along the edges), I suggest sewing a zig zag stitch down both sides of the zipper, catching both the fabric and the zipper tape. 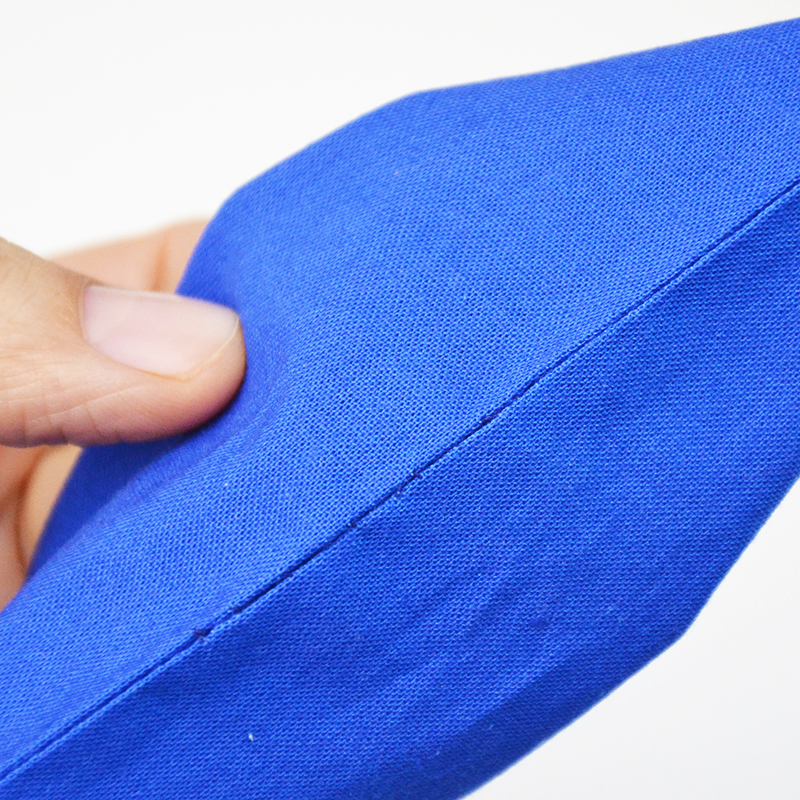 Flip the fabric right sides up and press it flat. 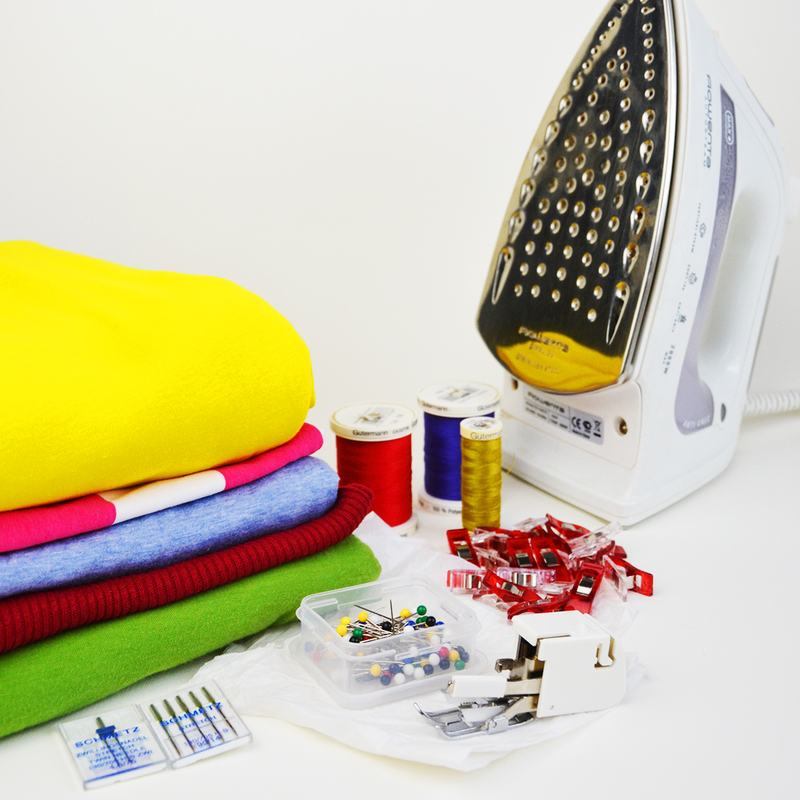 Pull the fabric gently away from the zipper when ironing and remember not to touch the zipper chain with the iron. This is what it will now look like on each side. It’s not absolutely neccesary to topstitch, but I highly suggest it because otherwise the fabric can bunch up and get caught in the zipper chain. You don’t need to stitch super close to the zipper, so you can probably sew right down each side without the slider geting in your way. 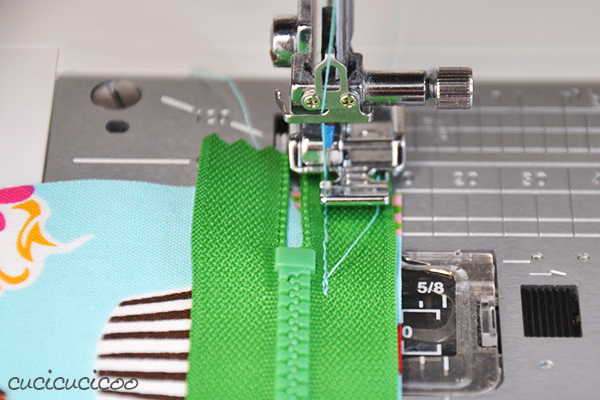 If you want to topstitch closer to the zipper, just use the same trick as before to move the slider out of your way. And there you have your awesome zipper sewn between two pieces of fabric! This is called an “exposed zipper” because you can see the zipper and some of the zipper tape, so you want to choose a color that looks nice with the fabric. 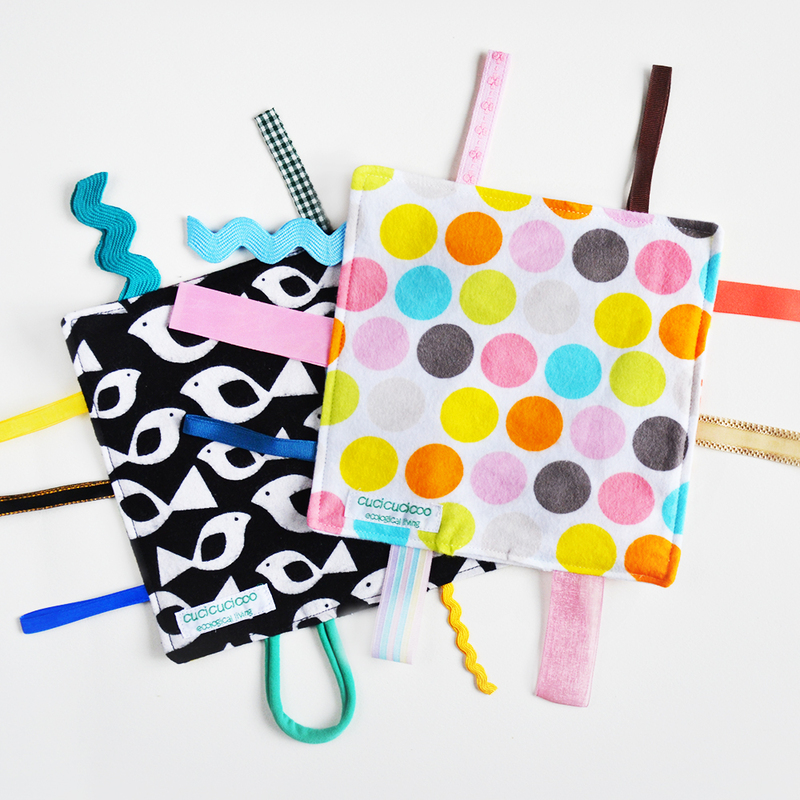 Next time I’ll show you how to turn this practice piece into a cute little pencil pouch. 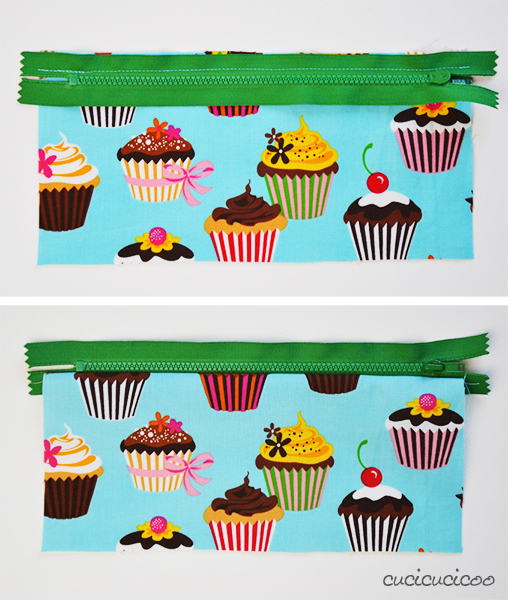 In the meantime, have fun playing with your zipper and making it eat things! 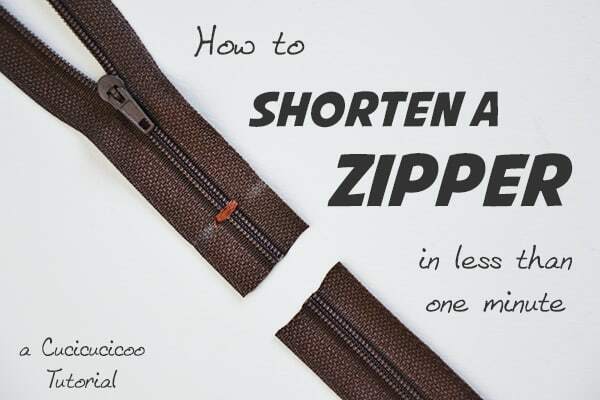 Update: I’ve added a mini-tutorial on how to shorten a nylon zipper, a technique that gives you more flexibility and takes less than a minute! 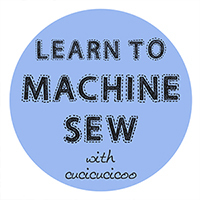 This lesson on how to sew an exposed zipper is part of the syllabus of Cucicucicoo’s beginner’s sewing course! Don’t forget to share pictures of your work on the Cucicucicoo Creations Flickr Group or the Cucicucicoo Facebook page! “ruota il tessuto”!!! E’ l’uovo di colombo, quando cucio le cerniere al momento di aprirle alzo il piedino e scorro piano piano il cursore ma si incontra sempre un po’ di difficoltà! (E’ anche il momento in cui ci si può innervosire!) Non avevo MAI pensato a ruotare il tessuto per dargli un po’ più di agio, e faccio bustine portatutto da anni! Grande, sei proprio sveglia, c’è sempre da imparare da tutti nel mondo del cucito. 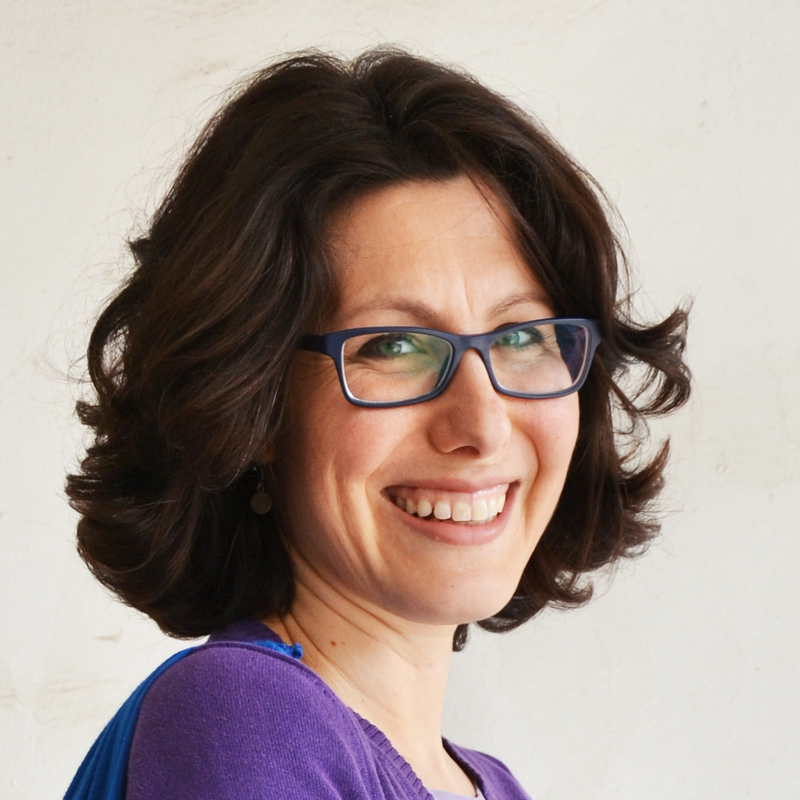 Ma è proprio così, Gemma, che c’è sempre da imparare e tutti possono imparare qualcosa dagli altri! (E a volte sono le cose più semplici che aiutano di più, ma non ti vengono mai in mente!) 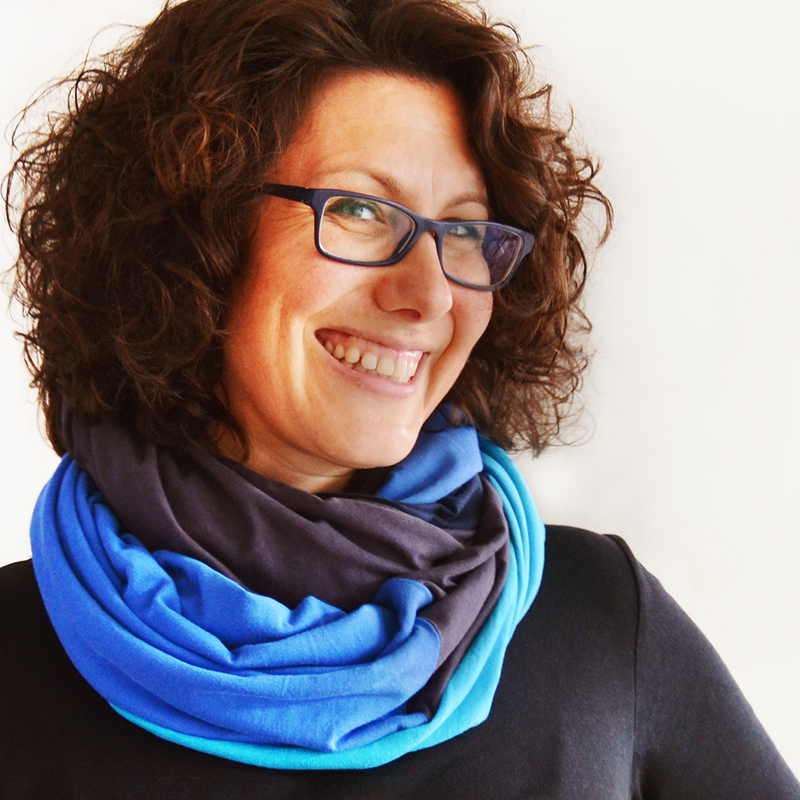 Spero che questa dritta ti sia utile in futuro, Gemma! 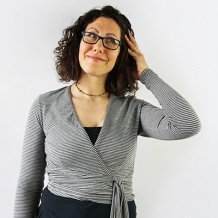 Lisa sei fantastica! Le tue spiegazioni sono chiarissime e le foto fresche e allegre. Eè un piacere seguirti! Grazie! Questo è il tutorial per le cerniere visibili, ne hai pubblicato uno anche per le cerniere invisibili?